team BEDS&LUTON is one of 45 Active Partnerships across England. Our goal is to have a Healthier, Happier and Fitter Bedfordshire. We bring together a range of groups across Luton and Bedfordshire, including local authorities, community organisations, national governing bodies, coaches, clubs and volunteers. Supporting, developing and promoting physical activity in the local area so everyone can have the opportunity to achieve a healthier, happier and more active life. The day to day team may be small but it's certainly mighty. We have 9 (representing full time equivalent of 5.7) dedicated members of staff working hard behind the scenes to organise physical activity and sporting events, manage projects and improve and develop facilities across Bedfordshire. Please get in touch if you would like to chat through an idea for a new club in the area, or are looking for help with sport or physical activity grant funding. Our board sets our strategic direction and their experience, commitment and passion for sport and physical activity helps to ensure that we continue to develop and succeed. 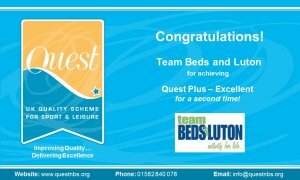 teamBEDS&LUTON is fully committed to the principles of equality of opportunity and is responsible for ensuring that no job applicant, employee, volunteer or member receives less favourable treatment on the grounds of age, gender, disability, race, ethnic origin, nationality, colour, parental or marital status, pregnancy, religious belief, class or social background, sexual preference or political belief. teamBEDS&LUTON will ensure that there will be open admission to all those who wish to work in partnership or alongside the teamBEDS&LUTON County Sports Partnership in all aspects of our work and that they are treated fairly. We have recently achieved an 'excellent' rating in a tough assessment by Sport England's leading national quality scheme, Quest. We are the first County Sports Partnership in the country to achieve 'excellent' in two consecutive assessments. Quest is the best-known improvement programme within the leisure industry and its rigorous assessments challenge even the very best sports development teams in the UK. teamBeds&Luton's Director, Lloyd Conaway, said "We are very proud to be recognised as an excellent sports development team. This is a fantastic achievement and a real team effort. Only 8 CSP's in the country have this top rating and we are the first County Sports Partnership to achieve excellent in two consecutive assessments. This is testament to the commitment of the team, the support and buy in from our partners and a strong culture of continuous improvement here at teamBeds&Luton."